Joondalup Podiatry Centre is one of the very first clinics in Perth to offer nail fungus laser treatment. It is a simple, safe and effective treatment that produces clear nails in patients with nail fungus, or "onychomycosis". No anesthesia, no side effects and no recovery period - only significant improvements to the appearance of your nails. How Does the Nail Laser Work? 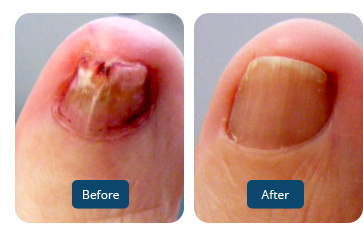 The Nail Laser heats the nail bed enough to kill the nail fungus and its spores. The treatment may feel hot, however it will not burn your skin below or around the nail. Research shows that the nail laser is 70–83% effective after a single treatment. You will be given post procedure information to ensure you get the best chance of successful results. The laser light which produces the heat is moved evenly over the nail in a grid pattern. It will take 3 – 4 passes to complete the treatment to each nail, taking approximately 1 - 3 minutes per nail. Microscopic colonies may be present on other nails - for this reason all nails on the feet will be included in our nail treatment. Patients report a heat sensation under the nail directly underneath where the laser is passing. This is often felt more on the second or third pass. If the heat gets too uncomfortable or intense, tell your podiatrist and they will adjust their treatment depending on your feedback. The treatment of onychomycosis (nail fungus) to result in healthy nail growth. Success rate is 70-83% unless the nail is re-infected. In most cases it is only one to two treatments, no downtime and no application of creams or daily tablets need to be prescribed. There have been no incidences of burns or overtreatments in all clinical studies done. 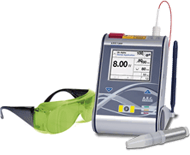 Laser safety procedures are followed to make this a very safe procedure. There are no studies to prove the treatment is safe during pregnancy, so this contraindicates laser treatment. Your podiatrist will assess you individually if you have diabetes, neuropathy or decreased sensation of the toes. The treatment may not work for you. It may be the heat cannot penetrate through to the nail bed due to excessively thick or misshapen nails. In this case the treatment would be repeated. Reinfection: Please read the post procedure information to minimise the risk of reinfection. We recommend the use of SteriShoe to destroy the fungus which causes onychomycosis. Two laser treatments are required, and regular check-ups are recommended to minimise the risk of reinfection. Some health funds offer a rebate, but please check with our staff and your health fund.